Our one-size reversible black stripe belt is black with subtle red & green pinstripes on one side and solid black on the other. 1″ width. One-size military buckle. Also available in Hook And Loop and D-Ring buckle options. Imported. For Larger Sizes, please visit the Uniform / Kids page. SKU: N/A. Categories: Military, Military Printed. An extra comfortable reversible belt in black with subtle red & green pinstripes on one side and solid black on the other (so you get two belts in one!). 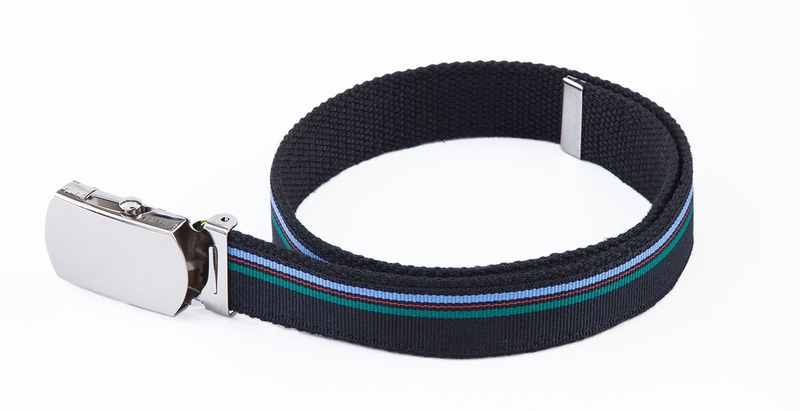 For extra comfort and durability, the belt is made with a 1" black cotton webbing support. One-size military buckle with nickel end tip. Fits up to a 23" waist. Can be adjusted for even extra small waists under 16 inches.